Above: Visitors to the Castle pass by a statue of Queen Victoria. 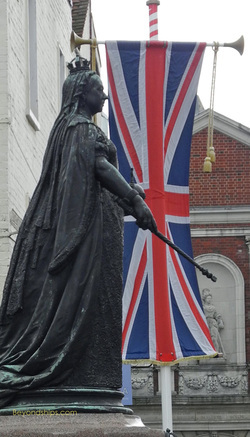 As the Castle had been thoroughly renovated and remodeled shortly before she came to the throne, Queen Victoria made relatively few changes to the structure. However, it was her home for many years and her remains are interred nearby at Frogmore. 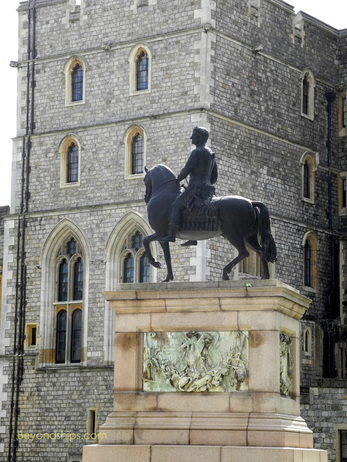 Below: King Charles II, whose equestrian statue stands in the Quadrangle, was responsible for many changes to the Castle. Above: After being admitted at the Visitors Centre, visitors walk along the Castle walls to the St. George Gateway to gain entrance to the Castle itself. The Edward III Tower is next to the gateway. Below: The Round Tower sits atop the original defensive mound built by William the Conqueror. Above: The formal garden on the East Terrace has the look of a Continental Palace. Below: Looking across the Quadrangle to the official State Entrance. (Visitors use an entrance on the other side of the building). Above: The Quadrangle seen from the other direction. 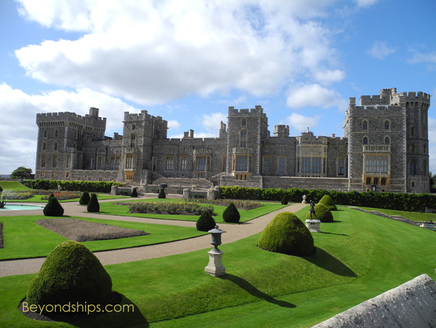 There are several reasons to visit Windsor Castle. Having been a royal residence since medieval times, the Castle is steeped in history. It is the largest castle in Britain and thus is architecturally interesting. It has an art collection that surpasses most museums. But, Windsor Castle is not a museum. Not only is it still used for state occasions but it is still a royal residence and home to the Queen. It has living functions. As such, it has a vitality that even the best of museums lack. 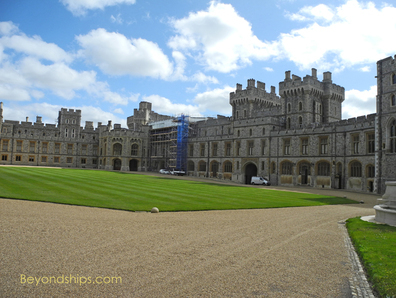 Windsor Castle dates back to the days of William the Conqueror. After the Norman Conquest in 1066, William wanted to strengthen his hold on his new realm by building a series of castles to defend London. 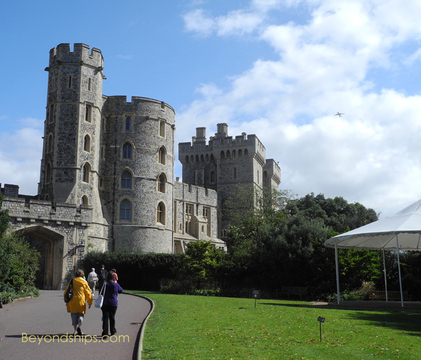 Windsor, with its chalk cliff overlooking the Thames, was a natural choice for one of the castles. Because of its proximity to London and because of the good hunting in the surrounding area, the Castle became a royal residence. 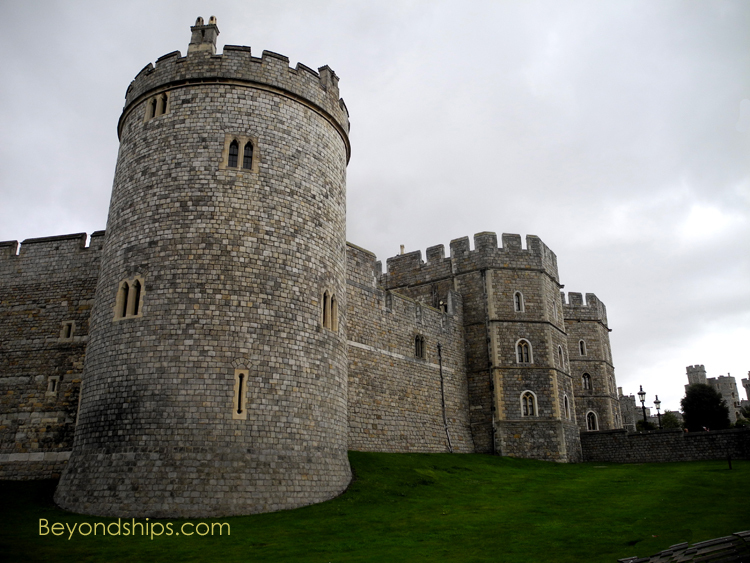 Edward III engaged in a major building program and made Windsor into a magnificent castle. In 1348, he founded the Order of the Garter, England’s highest order of chivalry. The Garter knights - - today mostly honored statesmen - - still gather at Windsor each year for a thanksgiving ceremony led by the Queen. Other kings who played a significant role in building the Castle include: Edward IV, Henry VII, Henry VII, Charles II and George IV. The Castle is on a hill and is divided into three sections. The Lower Ward is at the bottom of the hill. Up the slope is the Middle Ward and the Upper Ward extends along from there. After leaving the visitors center, you enter through a gate into the Middle Ward. Soon you will be standing below the Round Tower. The original Castle was based on a motte and bailey design. In such designs, a keep or strongpoint would be built on top of a man-made mound or motte. Surrounding the motte would be the castle walls or bailey. 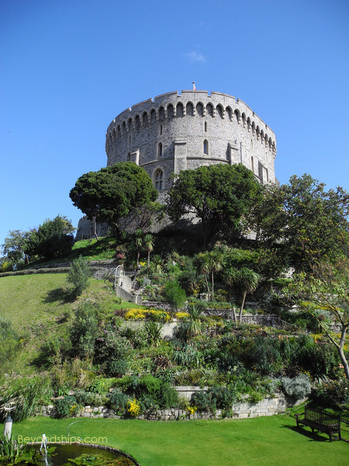 At Windsor, the Round Tower, which dates from the time of Henry II, sits atop the original motte made by William the Conqueror. Its slope now descends to a pleasant garden. One might well expect that a complex of buildings that were built over the course of ten centuries would be an amalgamation of different architectural styles. However, in the early 19th Century, George IV commissioned Sir Jeffry Wyattville to remodel the Castle. In the process, he harmonized the buildings in the then-popular Gothic style so that the Castle has a united look. Much of what we see today reflects Wyattville’s work. This is not to say that the Castle is the same throughout. For example, the Lower Ward has something of a medieval atmosphere with half timbered buildings close by the Castle walls. The East Terrace has a formal continental-style garden giving it the East Face the look of a European palace. 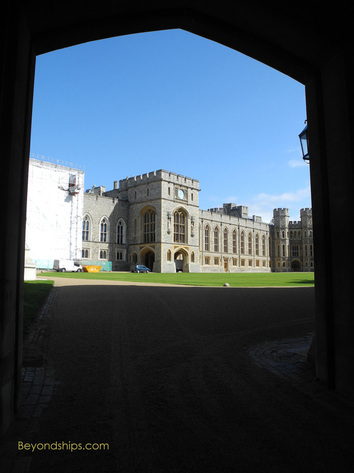 When the Queen is not in residence, a number of rooms in the Castle are usually open to the public. These are known as the State Apartments. At one time, these rooms were where the royals ate, slept and carried on their daily routines. Now, they are for the most part, used for ceremony and official functions. The State Apartments have been transformed over the centuries and do not reflect the Castle’s original medieval architecture. Rather, their present look chiefly reflects the work of two architects. Following the restoration of the monarchy, King Charles II commissioned Hugh May to adapt and decorate the rooms in the Baroque style, which the King had admired while in exile on the Continent. A century and a half later, Wyattville modernized and remodeled most of the rooms. His work reflects elements of Gothic design and early 19th Century tastes. All of the rooms are visually stunning both overall and in their detail. Indeed, on the walls you can find works by Rembrandt, Vermeer, Canletto, Lawrence, Gainsborugh, Rubens, Van Dyke and seemingly countless other masters. But do not overlook the wood carving by Grinling Gibbons, the Goeblin tapestries or the impressive display of antique weapons. Amongst other things, the State Apartments are used today for state banquets. St. George’s Hall, now restored after the devastating fire of November 1992, is often used to entertain visiting heads of state. The vast Waterloo Chamber, with its portraits of the monarchs, statesmen and generals who played prominent roles in the defeat of Napoleon, is also used for state dinners. Visiting these rooms, you get an impression of the scale of these events.